Camp Nou was built between 1954 and 1957, and officially opened on the 24th of September 1957 with a match between FC Barcelona and a selection of players from the city of Warsaw. 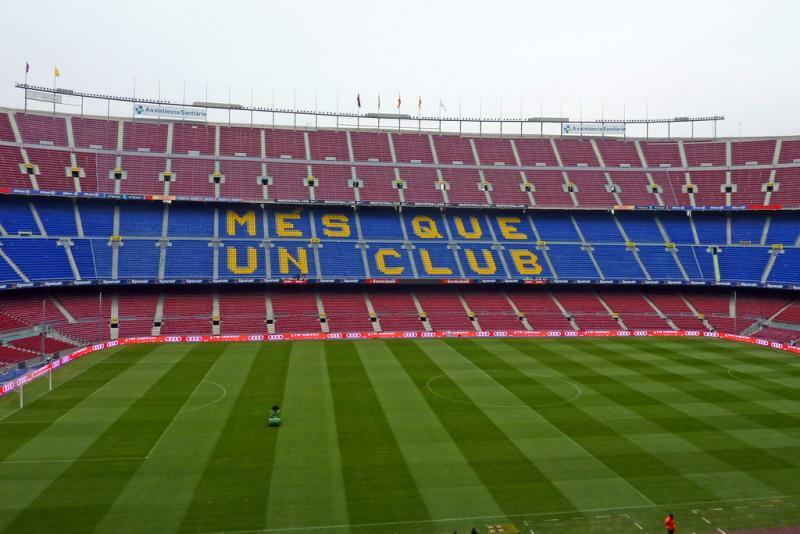 The stadium replaced Barcelona’s previous ground Camp de les Corts, which, though it could hold 60,000 supporters, was still too small for the growing support of the club. 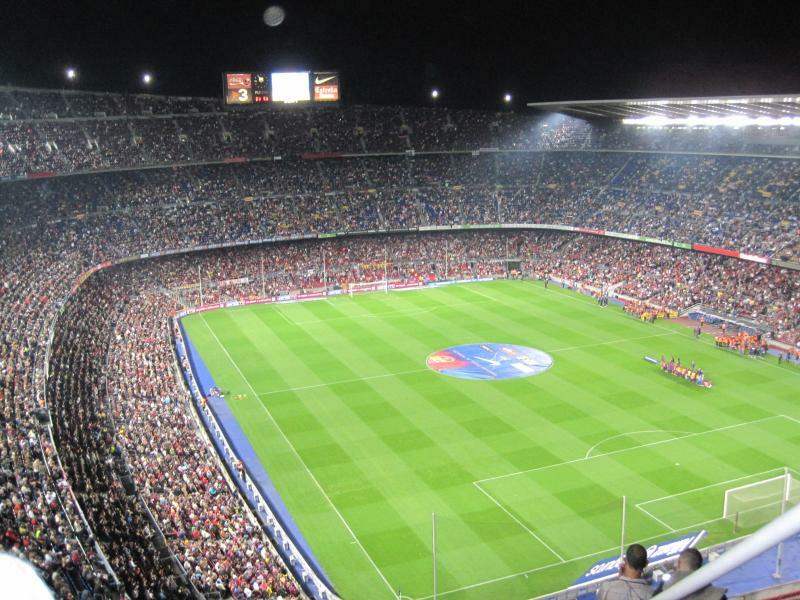 Camp Nou initially consisted of two tiers that could hold 93,000 spectators. 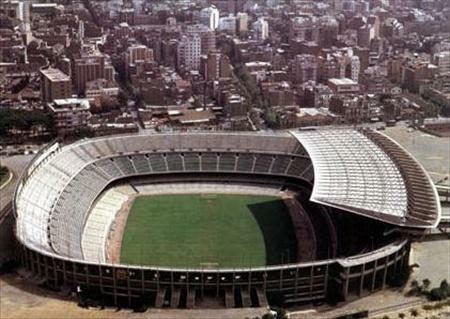 It was first called Estadi del FC Barcelona, but got soon referred to as Camp Nou. The stadium was, together with Estadio Santiago Bernabeu, playing venue of the Euro 1964 Championships. It hosted the semi-final between the Soviet Union and Denmark (3-0), and the match for third place between Hungary and the same Denmark (3-1). The stadium hosted two Cup Winners’ Cup finals in the following decades, the first in 1972 between Glasgow Rangers and Dynamo Moscow (3-2), and the second in 1982 between Barcelona and Standard de Liège (2-1). 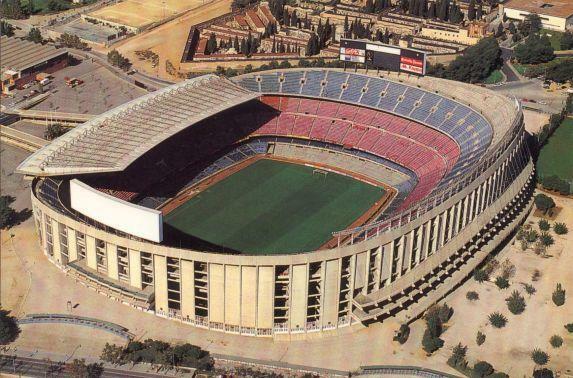 Camp Nou got expanded with a third tier for the 1982 World Cup, which raised capacity to 120,000 places. During the World Cup, it hosted the opening match between Belgium and Argentina (1-0), three matches in the second group stage, and the semi-final between Italy and Poland (2-0). In 1989, Camp Nou hosted the European Cup final between AC Milan and FC Steaua (4-0), which was followed in 1999 by the Champions League final between Manchester United and FC Bayern (2-1). 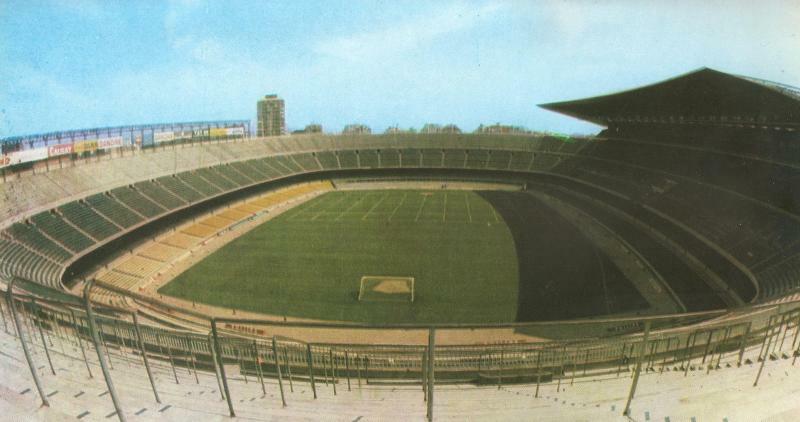 In the early 1990s, Barcelona started converting various standing areas into seating, which reduced capacity, though additional seats were created by lowering the pitch. 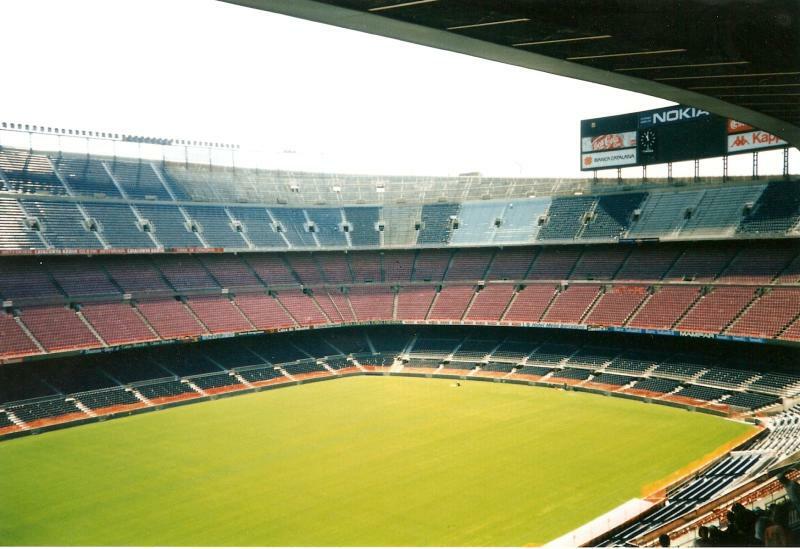 Until the late 1990s, Camp Nou still had some standing areas at the top of the third tier, but these were finally eliminated, reducing capacity to just below 100,000. 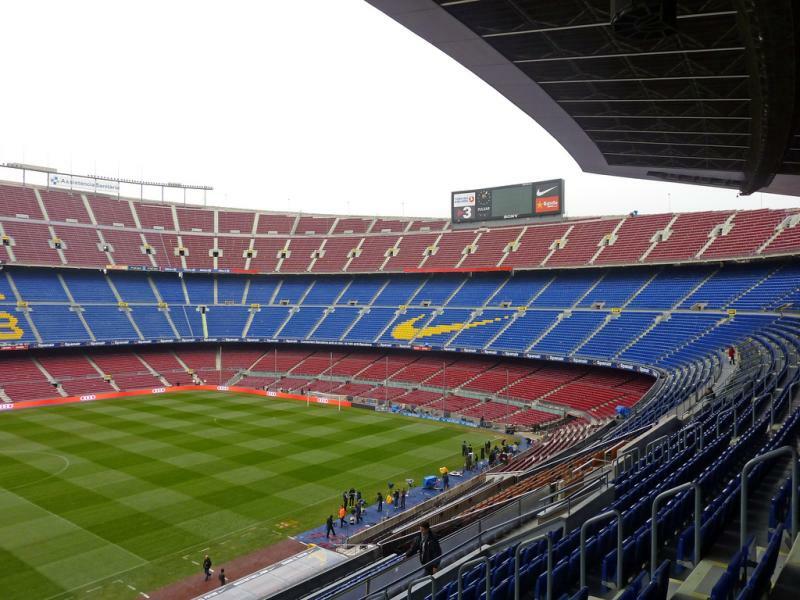 In contrast to the Bernabéu, Camp Nou has changed relatively little since its inauguration and lacks many of the modern facilities common in most stadiums these days. For the last decade, Barcelona have therefore been investigating either redeveloping Camp Nou, or even building a completely new stadium. In the mid 2000s, the club presented plans for a renovated Camp Nou, designed by Norman Foster, but a lack of funding prevented realisation. The club next started studying a move to a new stadium, but finally decided in 2014 to redevelop the current stadium. The redevelopment will entail the reconstruction of the first tier resulting in a steeper tier with better views, the extension of the top tier over the whole of the stadium, the construction of a roof to cover all seats, and expansions and improvements to the interior of the stadium aimed at providing better facilities. The resulting capacity will be slightly higher at a little over 105,000 seats. Works are planned to start in 2017 and gradually performed over four seasons to finish in 2021. 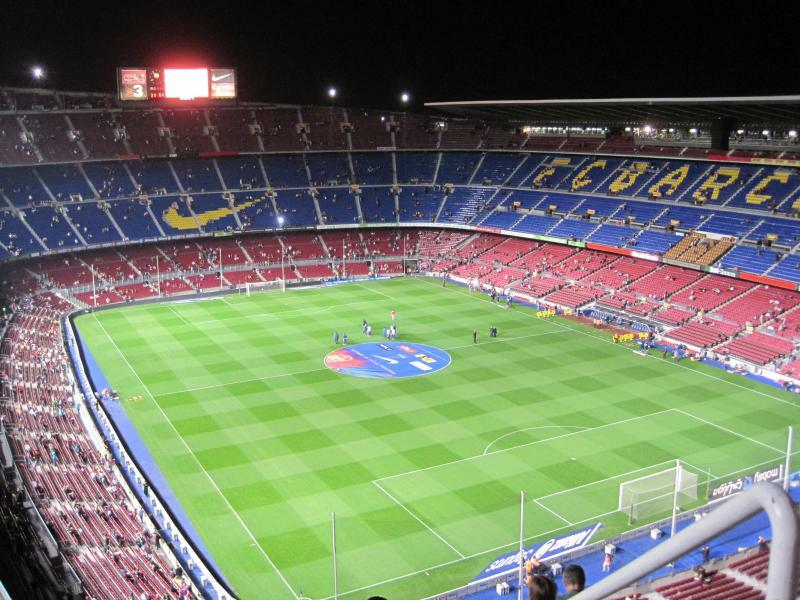 Camp Nou is located in the east of Barcelona, at about 5 kilometres from Barcelona’s historic city centre. The stadium is part of a sports complex that also includes Barcelona’s Mini Estadi. The stadium is easy to reach by metro. Various stations lie close to the stadium and from all of them it takes an approximate 10-minute walk to reach the stadium. From Barcelona’s city centre one can take metro line 3. Take the metro in the direction of Zona Universitària and get off at station Les Corts. The next two stations, Maria Cristina and Palau Reial, are equal alternatives. The journey from the centre takes about 25 minutes. If coming from the area around the Sagrada Familia, one can take metro line 5. Take the metro in the direction of Cornellà Centre and get off at station Badal or Collblanc. If arriving by car from the Ronda da Dalt (the motorway that runs west of Barcelona), take exit 11 and follow the Avenida Diagonal (B-23) toward the city. Keep right on the Avenida Diagonal (right of the tram tracks) and after almost two kilometres turn right onto the Calle de Sabino Arana (follow the FC Barcelona signs). Follow the bend to the left (don’t take the tunnel), and turn right onto the Gran Via de Carlos III. Follow for a few hundred metres and turn right onto the Travesía de las Cortes. After another few hundred metres you will see the stadium on your right. If coming from the A-2 (west), take the B-23 into the city, which will automatically flow into the Avenida Diagonal. Camp Nou is situated in a rather dense urban area (especially toward the east and south), and one can therefore find the typical local Spanish bars and restaurants in the vicinity of the stadium. The options pale, however, in comparison with what can be found in the centre, which is a short metro ride away. Most eating and drinking in Barcelona is centered in the historic centre (Gothic Quarter, El Born, and Raval), and there is more nightlife in the nearby beach and port areas. There is a wide selection of hotels, hostels, and rental apartments in the area around Camp Nou. Most are the typical tourist hotels and reasonably affordable. Hotel NH Rallye overlooks the stadium and gets good reviews. Hotel Madanis and Hotel Madanis Liceo come in a similar price category of between €60.00 and €80.00 per night. Hotel Catalonia Rigoletto and Princesa Sofia Gran Hotel are more luxuruous alternatives, whereas Hotel L’Alguer is somewhat more basic, and hence cheaper. 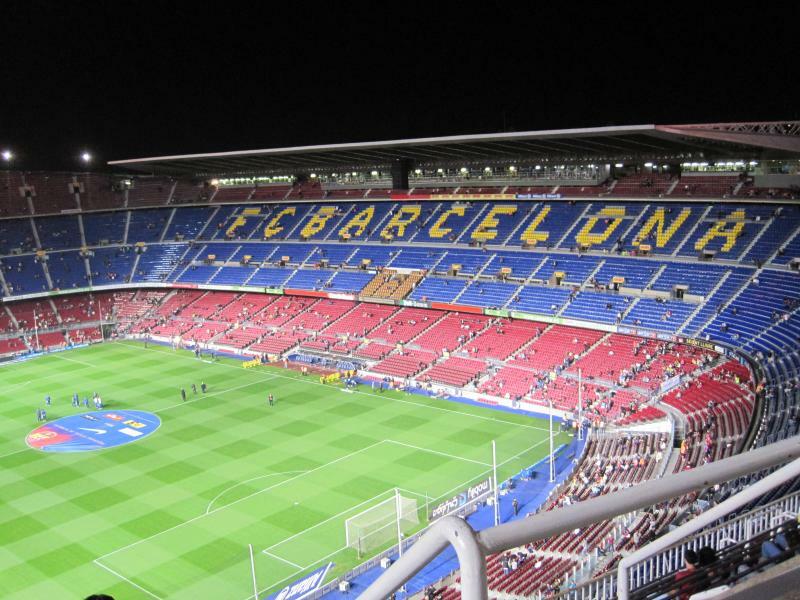 Click here for an overview of hotels near Camp Nou. There are also many hotels near Plaça d’Espanya, which is on both metro lines 3 and 5, and of course in Barcelona’s historic centre. Tickets for Barcelona games can be bought online, through the official website or Ticketmaster, at the ticket windows (taquillas) of Camp Nou, or through any of the other sales outlets, which include the local tourist offices and club stores. There are club stores on the Carrer de Provença 439 near the Sagrada Familia, on Plaça de Catalunya, and Maremagnum shopping centre in Barcelona’s city centre. If tickets remain, these can be bought at the ticket windows of the stadium on the day of the match (near gate 9). 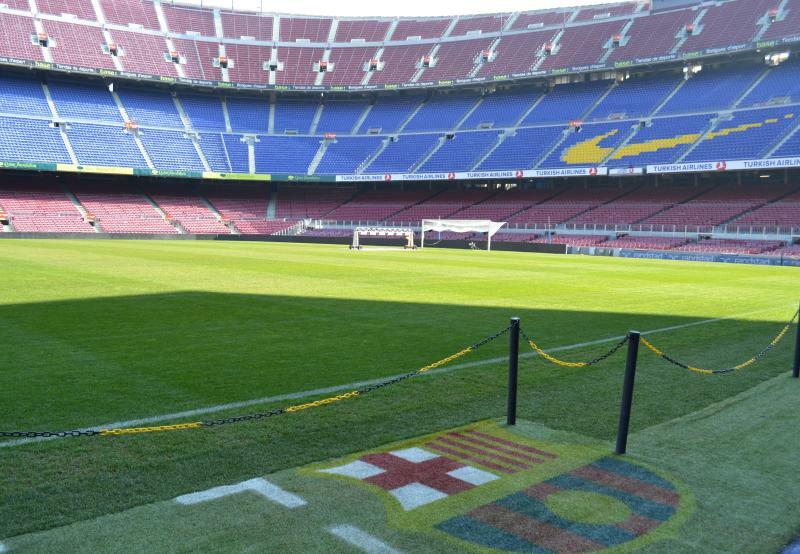 Barcelona sell out very few games per season, typically only El Clasico and high-profile Champions League matches. Tickets for El Clasico can only be bought by club members, and to get these you therefore need to search on the secondary market or use one of the many licensed agencies. The likes of viagogo and Ticketbis offer lots of choice and tend to be reliable, though needless to say that prices are high. Their prices for regular matches tend to be more competitive though, and can even be cheaper than face value so offer an alternative for the official route. Ticket prices depend on the opponent as Barcelona have divided their home games into multiple different pricing categories. For a typical match, expect to pay between €50.00 and €70.00 for a top tier seat behind the goal, between €60.00 and €110.00 for a lower tier seat behind the goal or upper tier seat on the long sides, and between €110.00 and €200.00 for the better seats on the sides. Prices will be even higher for some games, including, El Clasico and later stage Champions League games, and can be lower for a few low-profile games and Copa del Rey games. 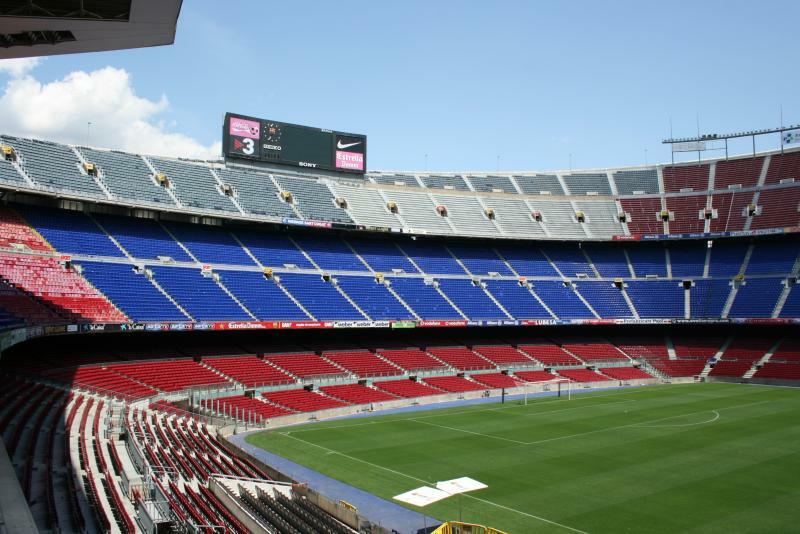 Barcelona offer self-guided stadium tours, called the Camp Nou Experience, which include a walk through the stadium with audio guide and access to the Barcelona museum. Private guides are available against additional payment. 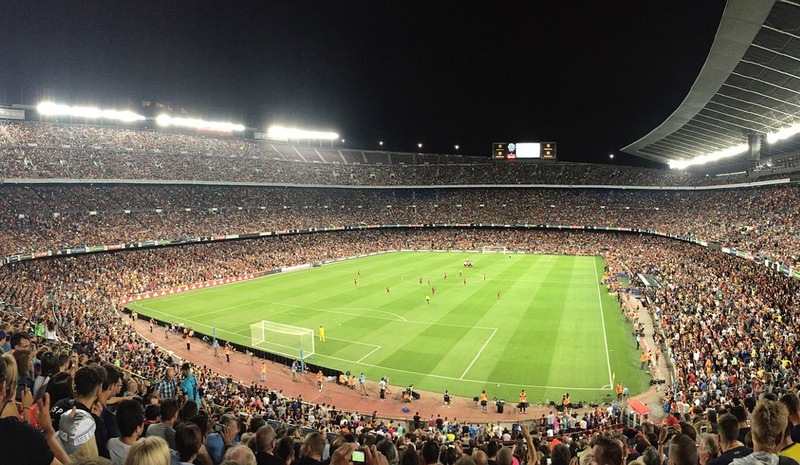 The Camp Nou Experience typically takes between 90 and 120 minutes. The tour opens Monday to Saturday from 10:00 am to 6:30 pm (half an hour to an hour longer in the summer months) and on Sundays until 2:30 pm (all day in the summer months). There are no tours on the day of a match and there is limited access the day before a Champions League match. The tour costs €24.50, which includes the museum. No reservations are required for groups of under 20 people, but they can still be made online. For more information call +34 93 496 36 00 (902 1899 00 from Spain) or email museu@fcbarcelona.cat. FcBarcelona.es – Official website of FC Barcelona. Barcelonaturisme.com – Official tourism website for the city of Barcelona. Visited the Camp Nou in 2013 as treat for my birthday. Seats in top tier so view was great, although quiet far obviously from the pitch! Mostly English people in this area, assumed all booked via same company! Though we were behind the goal you can also walk in the concourse and go round to the side of the ground, which we did at half time to get a different perspective of the ground. Though stadium was large I was surprised hold old and tatty it looked. From the outside a big grey structure, and once inside had to walk many steps to the top tier. The stadium concourses were very dirty, rubbish everywhere, it reminded me of going to UK football grounds in the late 80s and early 90s. Inside the seating area the view was impressive. Game kicked off 10pm so fantastic under lights. Despite Barca winning 5-0 the atmosphere was non existent from the home fans. Would recommend a visit to the stadium as an experience, but wouldn’t want to watch football here every week! Went to Camp Nou on 7th of April 2016, it was a great experience. However, 4 days after the visit, I notice that my credit card was charged despite of paying Euros in cash. I have inserted my card on the debit machine but never enter my PIN number since I realised I have enough cash. It’s 3am I will call my bank in the morning to dispute this transaction. I am calling for the management to look into this incident. Never been or camp nou, going with my daughter as she is fan of the team and some of the players 😉 . That Barca – Standard final was in 1982, not 1980. Just to let you know. The club museum is well worth a visit so that you can better understand the social and political importance of FCB. Can’t wait to go to see Sevilla on 23 November 2014. I’ve got the ticket from ticket masters for 150 euro. Lateral 2 centr. sup. Now I wish I should of wait till the day of the game. I can’t wait. I went to the Camp Nou for the stadium tour and then went to watch Barcelona against Valencia. I managed to buy tickets at the stadium for 83 Euros. Inside it is a nice ground but outside it does not even look like a football ground. Fans were very quiet, but i noticed a great deal of elderly people with blankets and sandwiches. There is no alcohol sold at the stadium, but smoking is allowed. Some people wearing Valencia shirts sat in the middle of Barcelona fans and it was not a problem at all. I found Barcelona a cracking place to go as a city. Santiago Bernabeu in my opinion is better stadium, but Barcelona is better place to go than Madrid. Jeremy you call Barcelona a boring city well it must be an other Barcelona you went to cause it’s one of the most pleasent city’s in Europe. As a Madrid fan i also went to watch a game of Barcelona on December 2012 in the CL against Benfica. 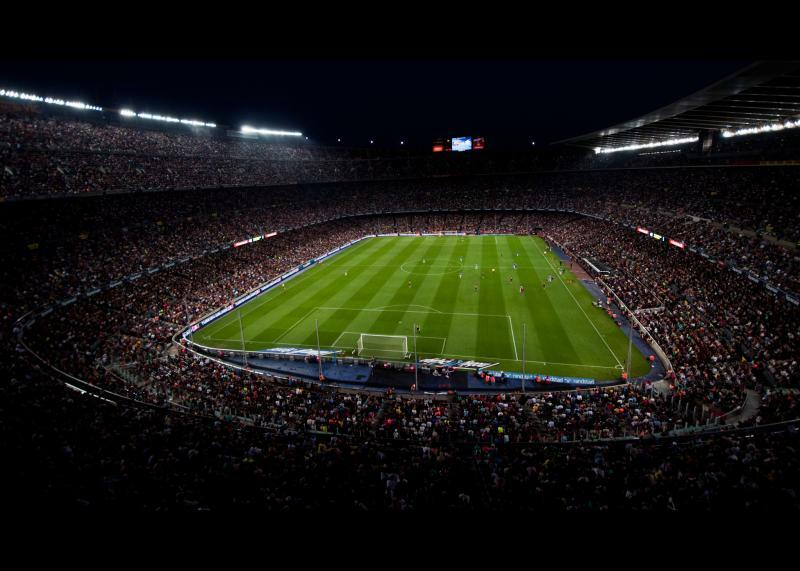 It wasn’t that important game anymore for Barcelona so less spectators about 50D but it’s also a nice massive stadion but not that nice like Bernabeau…. On Friday myself,Mark and Johnny flew to Barcelona in hope of seeing EL CLASICO as big CELTIC fans we knew it would be a lifetime experience.As we had no tickets we left our hotel on the Saturday morning wearing our CELTIC Polo shirts and headed to the NOU CAMP in hope of seeing the match.On our arrival we managed to get three tickets and experienced the game of a lifetime.The Barcelona fans were magnificent with us.Be proud of ur SPECIAL CLUB and THANK YOU ALL. HAIL HAIL BARCA. I visited Barcelona back in the 1970’s. Franco had just died and Juan Carlos was making his first visit as King. Incredible political “charge”. Anyway, sat Barcelona featuring Cruyff & Neeskins vs Atletico (the other team from) Madrid. The greatest soccer game I’ve ever witnessed in an amazing venue! What a wonderfull way to spend a saturday night. Managed to get tickets for Barca v Real Madrid and watched a floodlit spectacular amongst 99,000 plus sell out crowd. A must for anyone who likes football – or even if you don’t. Went back the next day and did the stadium tour – well worth it – vast,impressive,a bit shabby but overall awesome! Just do it if you get the chance. What an awesome experience! 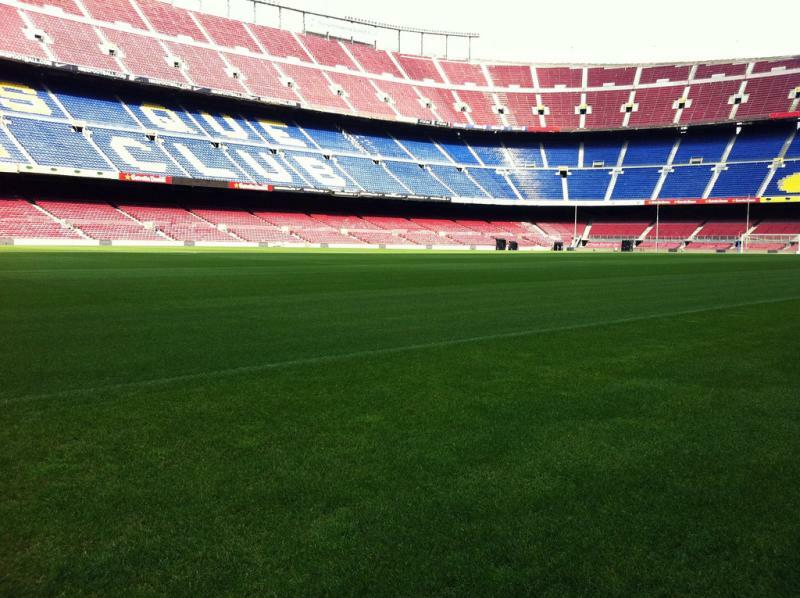 I visited the Camp Nou in July 2012, it was amazing. As a football fan I was blown away by the size of the place. Not bothered about whether it needed a bit of paint, you’re not there for that. To take in the surroundings, sit/stand in the stadium, see the dressing rooms and sit in the commentators seats……well, it was just out of this world. The city of Barcelona is also an excellent, vibrant, exciting place to visit. The stadium tour was exceptional, and a pleasent change to visiting the shopping districts with my girlfriend, who also came and enjoyed herself. I have plenty of pictures in the stadium and also got to have a professional picture taken by the club’s photogrpaher with the European Cup! Not to miss! Visited the Nou Camp in 2003. Highlight of a trip to an otherwise boring city. Went to the Nike store and got my shirt printed (very expensive) and did the museum. The stadium itself is massive. Went to the Camp Nou earlier this year while on a visit to Barcelona. Had done a stadium tour in the past which was good, but doesn’t compare to seeing a match live. Couldnt get a ticket at the stadium as they said the match had sold out, but still managed to get a ticket online from a ticket reseller. The price was slightly higher but included delivery the ticket to my hotel. There are a few companies offering this package, I used barcelonaticketstore.com and have no complaints. As a stadium, its a little shabby around the edges. It clearly needs a bit of a facelift in the concourses, and the atmosphere can be surprisingly quiet at times, but to see the ground full is something else!